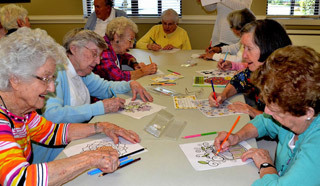 Mind - Grace Ridge Retirement Community - Morganton, N.C. Enhance your mind and your mood through thought provoking classes and lectures at our own Grace Ridge University. Or explore continuing education at Western Piedmont Community College, less than 5 miles away. Test your culinary skills with a cooking class. Learn to row a canoe – or even build one! Meet some of the world’s greatest authors or venture into the past with a literary or history class. By helping you tap into your potential and new learning pathways, Grace Ridge proves that good moods begin with mind over matter. Residents are encouraged to take a class (or two), finish a degree or discover a new passion – all at little or no cost to you – at nearby Western Piedmont Community College. 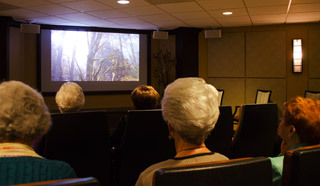 Lifelong continuing education classes are also available onsite through our own Grace Ridge University, as well as clubs and activities where you can learn from the best – our residents! For even greater intellectual stimulation, our residents enjoy cultural excursions to exciting events and destinations throughout Western North Carolina and beyond. In 2015, we unveiled a brand new, state-of-the-art theatre, giving Grace Ridge residents a front-row seat at the box office year-round! Keeping the mind healthy requires more than activity. It requires care and support. 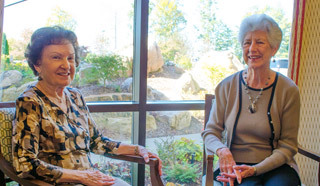 Grace Ridge offers a number of senior support groups for discussion and companionship.